Wednesday night, Dillner battled for a top five finish in the Sport Truck division at Oxford Plains Speedway before the engine in his Speed51.com/Hull Automotive #51 truck expired. He then finished in his dead heat with Johnny Clark in a 10-lap match race. Click here for more. Last Friday night, the Speed51.com team hightailed it from New Hampshire International Speedway for yet another race. But this time, they weren’t covering the feature. They were the feature. Getting into the TD Banknorth 250 is a big deal. More than double the number of cars usually show up for the prestigious race at Oxford Plans Speedway than can make it into the starting field. 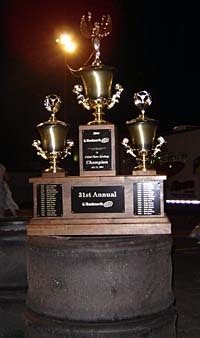 Last season, Ted Christopher, Joe Bessey, Richie Dearborn and GeGe Gravel were all among the drivers going home early. The road to the starting field for the July 31st event means advancing through a tough set of heat races and consolation events for most drivers, but there is also another way to go into the big show. The winner of Saturday night’s 100-lap Late Model show will be given an automatic starting spot for the 250 on Sunday afternoon. A few minor changes are needed to make a Late Model legal in the Pro Stock ranks. Henry Hudson III made history several summers ago as the only driver to qualify for the TD Banknorth 250 in two different cars, winning the Late Model prelim before racing his way into a better starting position in his Pro Stock machine. There will also be a 100-lap ACT Late Model feature at Oxford on Saturday night, July 30th. Speed51.com’s Bob Dillner will be running his third short track race in an eight day span Friday night at Big Diamond Speedway (PA). Dillner is at Pocono Raceway (PA) covering the NASCAR Next Cup and ARCA RE/MAX Series this weekend, but will make the short trip to Big Diamond for a little bit of side action. Dillner will drive Jake Smulley ‘s#4 NASCAR Roadrunner on a night when double feature for the NASCAR Dodge Weekly Series Modifieds and a visit by the United Racing Club Sprint Cars are also on the card. Dillner called Thursday afternoon to confirm he would be racing in the roadrunners tonight. Bob Dillner, Matt Dillner, Mike Twist and Justin St. Louis all took part in a night of special races at Canaan Fair Speedway (NH) that also included crew members from the NASCAR Nextel Cup teams of Evernham Motorsports and Hendrick Motorsports racing. Everyone got the opportunity to wheel Sportsman Coupes on the track’s oval. The winner of the Speed51.com event was our new guy, Justin St. Louis, who barely held off Bob Dillner at the finish. Plans are already being discussed for a rematch on the Friday night before the September races at NHIS. Bob Dillner might not race as much as Ted Christopher, but three events in one week is still very impressive. It’s a good weekend to be a Modified fan in Northern New England. It might actually be too good of a weekend in fact. The NASCAR Whelen Modified Tour makes their only appearance in Maine on Saturday night at Beech Ridge Motor Speedway (ME). A 9:00pm green flag is planned for that event with time trials starting at 5:15pm. Meanwhile, a little over one hour down I-95, the True Value Modified Racing Series will be logging 100 green flag laps at Star Speedway (NH) on the same night and at approximately the same time. 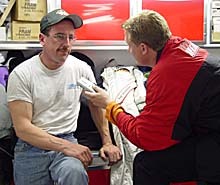 In the week leading up to, and the week after, the NASCAR Nextel Cup race at New Hampshire, Ken Schrader raced at three different New England short tracks in three states. He ended up winning two races and finishing ninth in the third one. Not bad for a summer vacation. Schrader tuned up for NHIS by winning a USAC Silver Crown exhibition race at Stafford Motor Speedway (CT) over the likes of Bentley Warren, Carl Edwards, Dave Blaney and Sammy Swindell. Next, Schrader won a late model feature at Wiscasset Speedway (ME) and then he made the trip to Vermont’s Thunder Road Speedbowl to run their weekly Late Model show. Schrader ended up finishing ninth there.